Danni's Dreams: Time to do the Whimsy Digi Team hop! Time to do the Whimsy Digi Team hop! It's time to hop along with the Whimsy Digi team! Are you enjoying all the fall creations so far?? You should have arrived from Anneke's wonderful blog, if not, start at the beginning at the Whimsy Inspiration Blog! Be sure to leave comments as you hop along as there will be 2 blogs randomly chosen and from those blogs will be a random winner of a digi of their choice! On the last stop of the hop at Lisa's blog will be the grand prize winner chosen and they will receive 5 digis of their choice and the chance to be a guest designer for Whimsy Stamps! Here's my creation for today~ I made a little shopping bag with my Cricut (Tags, Bags, Boxes and More cartridge) then I colored and cut out the fun Thomas Turkey. I made a little mat for him with my Cricut-Make The Cut program, embellished a tad and tada--a fun little fall bag. I had thoughts of using this as a centerpiece or table decoration but couldn't think what to put in it...then I thought how fun it would be to have autumn leaves in it...well, being in the desert, that is not an option here so we're just pretend that there's a gorgeous autumn leave bouquet in the bag, okay? 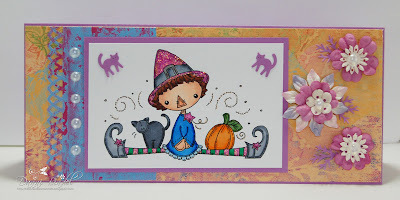 Next I used the new image,Cute Sitter Witch, to make a cute card~ I am already sort of burned out on the "typical" Halloween colors so I gave her some brighter colors. As the card progressed, I realized that it's a very pretty Halloween card, didn't know that was possible! LOL! Now you should continue the hop on to Angela's fabulous blog! And don't forget to go shopping when you're done with the hop!! cute cards Danni! and I love the cutie Halloween design in those colours. Super creations Danni. Love the bag and your card is really pretty. Love your little Turkey bag, so adorable, maybe fill it with fake fall leaves if you can't get the real thing! Cute, cute stuff. The bag is just adorable. And what a great card!! They both are really great,love your coloring. Danni, such a fantastic cards.The images are so sweet and cute. Fabulous creations, Danni! I love the images. Beautiful work Danni...i love the bag it's stunning! Awwww, both of these creations are fabulous!! Just love that turkey bag and the sweet nontraditional Halloweenie card!! Fantastic creations Danni, LOVE that bag you created!!! AWESOME job with these images girl! That tote is darling, as well as the card - very sweet! These are both wonderful, Danni! 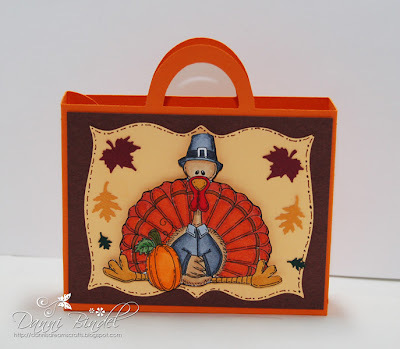 Love your little turkey bag.. so cute for a Thanksgiving table! Your work is fabulous! I just love it. I find them so adorable. The turkey bag is so beautiful. Both of these are so darn cute, I would hate to have to choose which I like the best. Hello Danni, fun cute bag you created. Love both images!! Fabulous work. Just love both of them. Beautiful creations Danni love the colouring and gorgeous design, with perfect details. I never thought Halloween would go in pastell colours but it looks wonderful. How are you? Pleased to meet you, I am Casper! Your cards are amazing, Thomas Turkey! Poor you,I will send you some leaves,plenty here in Scotland! You could put your Trick or Treat candy in your Thomas Turkey bag to hand out to the kids & then use it as a lamp - you can buy all the fittings you need & a low watt bulb would be fine in the bag. Ask you Local D.i.y store.